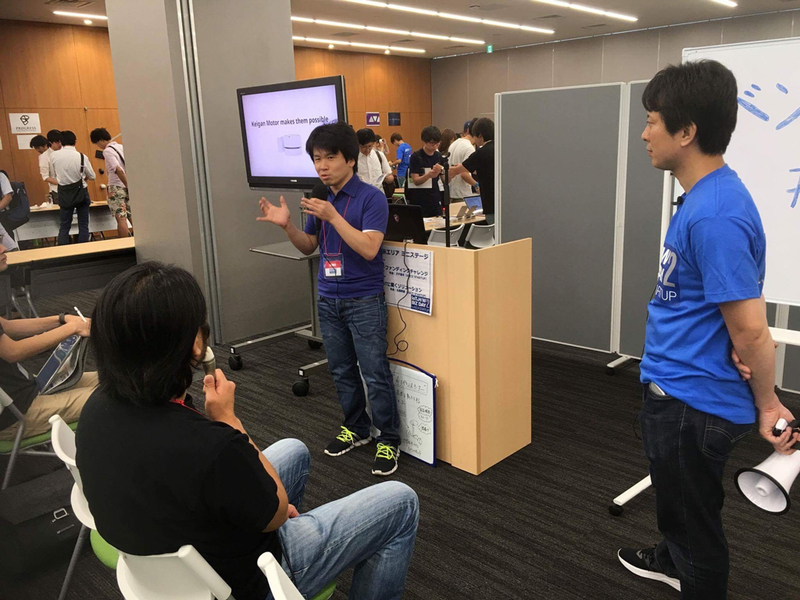 On August 26th, “IoT＆H/W BIZ DAY 2 by ASCII STARTUP” was held sponsored by ASCII STARTUP. (Picture 1: photo from the event) The event involved corporate participants creating new products related to loT. 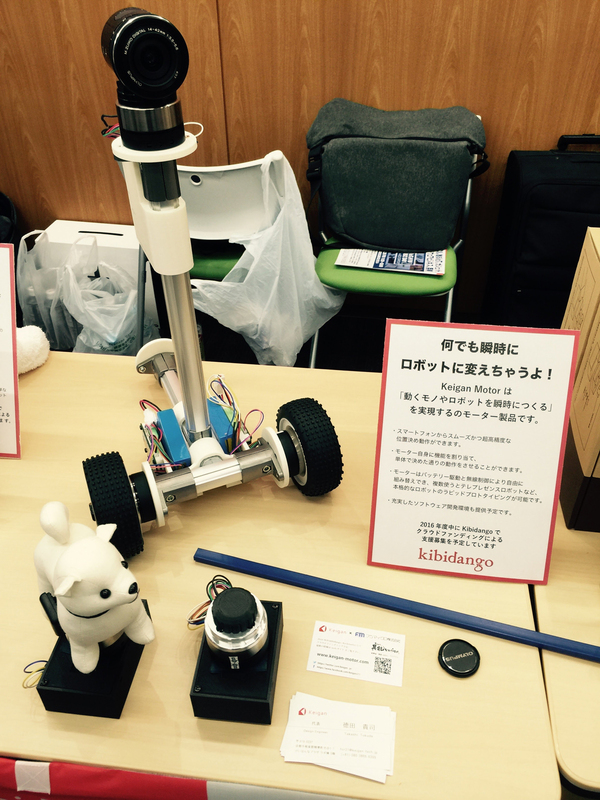 Our company displayed our KeiganMotor (in the Kibidango booth) and held a presentation about “Crowdfunding stage.” KeiganMotor’s concept is to “build a robot and move things in a moment.” We displayed two items. The first is “the motor which remembers different functions,” our very first disclosure of the said item For example, as seen in the video, once the motor on the right starts moving, the motor on the left moves, too, in order to move the dog robot as shown. This kind of function can be used without having to use a smartphone. KeiganMotor is capable of carrying out functions and movements that can be easily programmed by people. Moving on, the second item on display is our “Camera Robot.” Since KeiganMotor is powered by batteries, it doesn’t need to be connected to a power outlet, nor does it need to be connected to other motors, since it communicates wirelessly. Because of this, it’s possible to set up a robot as shown quickly. The robotic functions can be programmed and carried out using a smartphone, as shown in the video. Of course, the robot can be controlled by using the smartphone to carry out precise movements such as the movement speed, direction, and the direction of the camera. Also, those who are familiar with programming can put together a set of simple codes to control the robot however they want (we will provide an update later regarding the development system). Please note that the functions shown during our demo are still in development and subject to change once they’re ready to be sold. As for the camera part of our camera robot, we used “OLYMPUS AIR A01 （https://olympus-imaging.jp/product/opc/a01/）,” an open source project by Olympus. 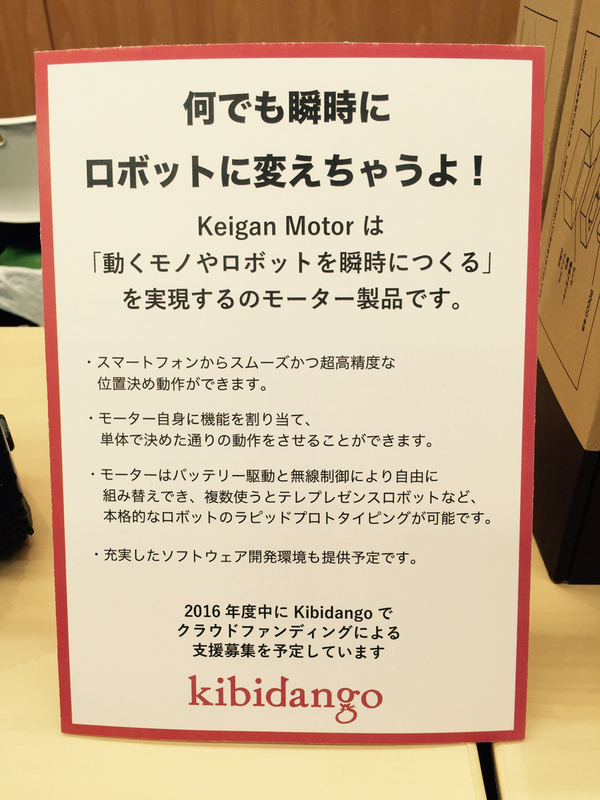 Finally, we held a presentation regarding “Crowdfunding Stage.” (Picture 2, presenting) We introduced the charms of KeiganMotor’s features for the first 10 minutes. The video for this will be posted later, so we invite you to check it out. During this exhibition, a lot of people came to our booth until the very end, and we got much feedback. Meanwhile, we also got questions and opinions regarding how to use the product for specific purposes, the background of people who developed it, as well as how the final design will turn out to be. (Picture 3, explaining using a whiteboard) We are scheduled to upload a video showing the advantages of using the product. The video will show various uses of the product as well as its ease of use. We hope the video will help those who are interested in our product. After participating in “IoT＆H/W BIZ DAY 2 by ASCII STARTUP,” we felt we were given new tasks and responses from our guests. 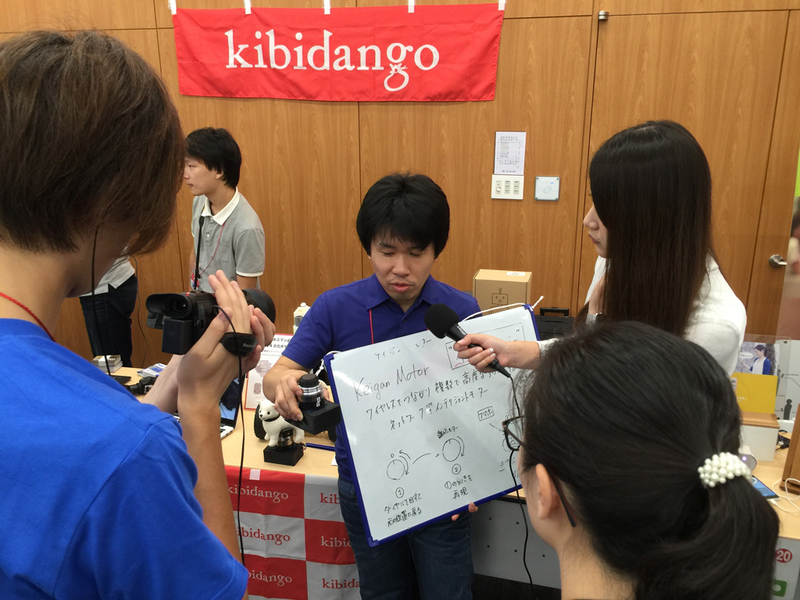 This exhibition was held by courtesy of Kibidango. We would also like to thank Aoi-san, the person who was in charge at the exhibition.